Mary-Kate and Ashley Olsen as Elsa and Anna (photoshop). At least I think it's photoshopped. I don't know who did it. 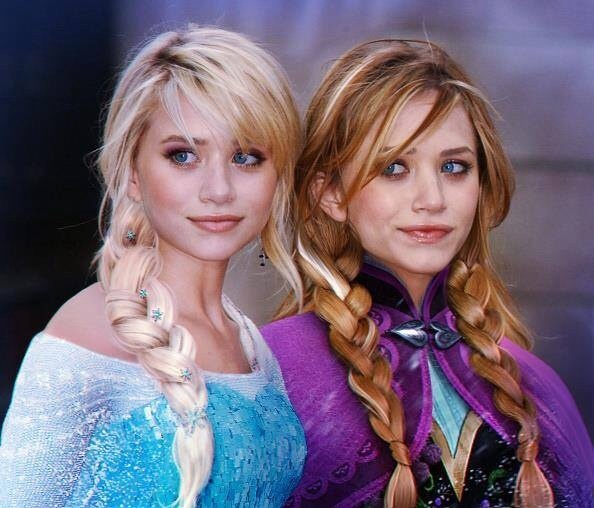 I saw it on the Elsa Facebook پرستار page.. Wallpaper and background images in the Disney Princess club tagged: photo disney princess frozen anna elsa mary-kate ashley olsen. At least I think it's photoshopped. I don't know who did it. I saw it on the Elsa Facebook پرستار page. This Disney Princess photo might contain کاک کپڑے, میان, کوکٹیل, لباس, پورٹریٹ, آرچر, closeup, تصویر, and ہیڈشوٹ.